Robert and his family were rescued by HHFL from a refugee camp during the Kenyan clashes in early 2008. The family lost their home and business to a fire in Nairobi’s Kibera slum and many of their family members were murdered. Robertʼs mother and older sister are both HIV+. Robert is a very sensitive child who functions at a Grade 3 or 4 level. He does not know how to read but understands English at a very basic level. 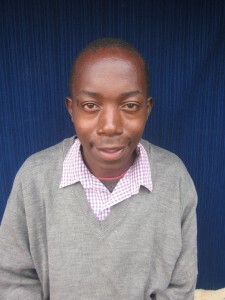 Jacaranda Special Needs School has been a wonderful place for him where he is learning carpentry. Robert adores music and loves computer puzzles. He has discovered a passion and talent for carpentry and is a star marathon runner. He wins all his races. All his teeth were removed when he first arrived at HHFL in 2008. He was in constant pain for years. Robertʼs biggest wish was to get dentures, which he received thanks to HHF! Now he wonʼt stop smiling.